Microsoft has today started rolling out its new Xbox update to select Xbox Insiders, providing them with plenty of new features, enhancements and tweaks to enjoy. The first wave of Xbox One features for the Creators Update to the Xbox Insider Program, contains new features for both Windows 10 PCs and Xbox One and is about “performance, people, competition and streaming” says Microsoft. Those unfortunately not receiving the Xbox update today can expect to enjoy the new features in the coming weeks. Microsoft explains a little more about what you can expect with regards new features and enhancements in the preview trailer below. – An updated look at Home: One of the first things you’ll notice is a new look for Home. 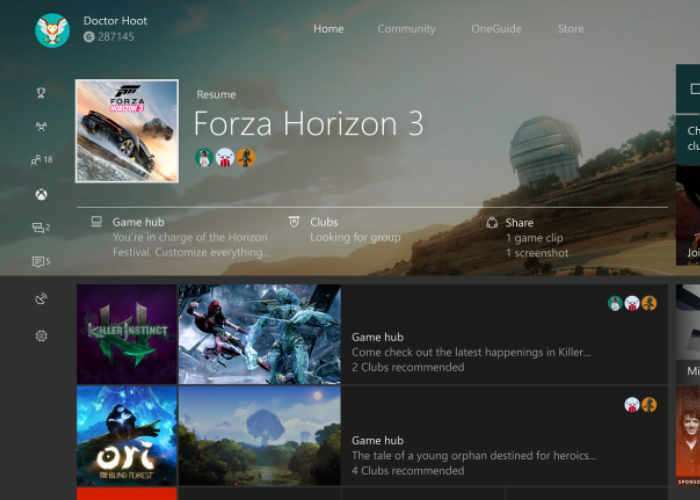 Through the Insider program, we’ve received feedback from Xbox One gamers that the UI can be complex and for certain tasks, can require too many button presses. Our goal is to simplify the UI and increase overall system performance, and that starts with updating Home based on what you care most about for the games you play. To do that, we’ve optimized for speed and are surfacing to you the most valuable content for your games. You’ll notice the main tile for what you’re currently playing has changed. Now, you’ll see a smaller icon for the game and a few options to dive deeper into the Game Hub, interact with your Club or LFG for that game, view your Achievements, and more. The updated Home also celebrates the game you’re currently playing with hero art in the background when you’re not using a custom background..
– New way to multitask: In addition to adding a new start page to Guide, we’re also evolving our multitasking system. To simplify discoverability and to make it much quicker to get to the things you care about most, our multitasking features will also be designed to work well with the new Guide. In addition to quick access to music, screen shots and GameDVR will be one button press away. You can bring up Guide and press “X” or “Y” on your controller to record your favorite gaming moments. We’ve also added a new achievement tracker which allows you to track your favorite achievements and play at the same time. The new Guide is also where you will be able to broadcast instantly to Beam when we roll that out to Insiders in the next couple of weeks. – Cortana gaming enhancements: There are a series of new Cortana updates to make your Xbox One smarter. In this update, you can set reminders and alarms so you don’t miss gaming sessions. In the coming weeks, we will be releasing more Cortana updates to enhance your gaming experience even more as well as continued performance and reliability updates. – Improving system updates: Our goal with system updates is that you never have to worry about them again, and to make it clearer when a system update is available. To enable this we are updating the interface so the steps are easy to understand. We’re also going to enable every Xbox One owner to keep their console, games, and apps up to date independent of which power mode they have chosen. For more details on the latest Xbox update jump over to the official Major Nelson website via the link below.